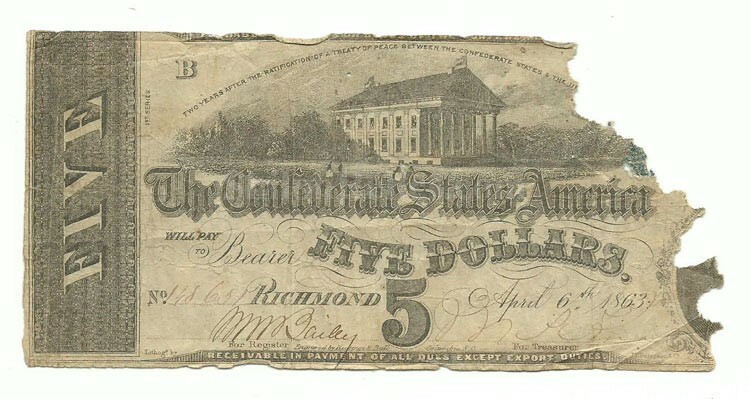 This is an original 1863 Confederate States of America $5.00 bill. This is the style that has the Confederate Capitol at Richmond, Virginia in the center of the note. In the lower right hand side would have been the likeness of C.G. Memminger who served as the Confederate Secretary of the Treasury and was the key man in production of Confederate paper money. The note has the correct hand signed and numbered. On the back of the note it has the ornate blue ink print that gives it a wonderful look. This is the pattern of Confederate note that is listed as T-60 in Criswell’s book. The note is rodent damaged on the right and priced accordingly. The note comes in an acid free holder for preservation and display.